When Lord Krishna was born at midnight, Nature announced this with heavenly showers and lightning. When Sathya Sai arrived, the Raju house was awakened that midnight with drums belting out rhythmically and the tambura twanging automatically. Adi Sesha, the Divine Serpent, was among the earliest who showed up to seemingly 'protect' Krishna but actually came to behold the new charming form of his master. And it was no different in Kaliyuga too. As soon as little Sathya was placed on a bed, from under the sheets emerged the much-worshipped cobra who was again waiting to be among the first to touch the Lord. Bala Gopala mesmerised all with His magical flute while little Sathya enthralled the folk of Puttaparthi with His Pandhari bhajan group. If Krishna indulged in nectarous pranks, that too continued with Sai. Both of them knew how to quietly and cleverly escape from the house and be present with those whose hearts reverberated with His name and form. Miracle-years done, it was time for delivering the main course with much force and supreme authority, and gushed forth from the Divine Heart the Song Celestial, the Bhagavad Gita. Now too it is Bhagavad Gita but in its most modern avatar, expanded and explained in several ways over so many decades and through innumerable timeless discourses. 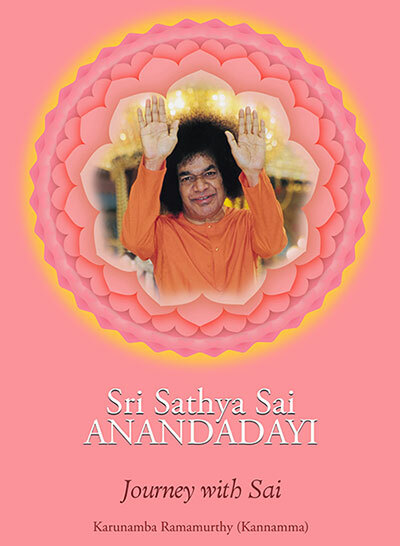 To give you just a glimpse of this fascinating Sai Krishna, we have culled out a few instances recorded in the popular book “Sri Sathya Sai Anandadayi” by Mrs. Karunamba Ramamurthy. The first one is a powerful revelation in a most dramatic manner of who He truly is. The second reiterates how fortunate one is to step his or her foot in Prasanthi and what can that do to us. The third is a beautiful brief sketch of Swami's daily routine in the 1940s; it gives us a peek preview into how the Lord literally lived His message in every second of His earthly sojourn. 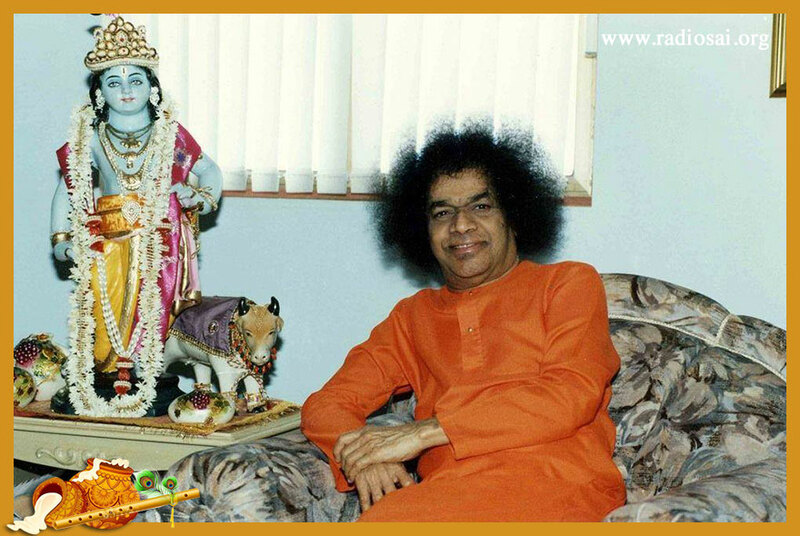 So go ahead and enjoy this treat of Sai Krishna Leelamrutham – the sweet divine sport of Sai Krishna! In April 1949, my mother went alone to Puttaparthi and stayed there for a month and returned. During her stay, two college students from Chennai came there. Swami had appeared in their dreams and told them that He has taken avatara in Puttaparthi. He had asked them to come and have His darshan. They had located Puttaparthi with great difficulty. They were sadhakas (spiritual aspirants). Swami had sent word through Sri Seshagiri Rao, an inmate of the ashram, to these boys that they should bathe in River Chitravathi before entering the mandir. Accordingly, they went to the river. Quite interestingly, they saw two divine feet, bejewelled with anklets, leading them with enchanting sounds. After their bath, they started washing their clothes splashing water all over. And then they had a vision of Panduranga in the form of a small boy. He would clutch His pitambara (yellow dress) and move away to avoid the splashing water from falling on His pitambara and would come near when there was no splashing. Wondering at the mahatva (sanctity) of the place, they praised Vithala and returned to the mandir. Again, the same two feet with the sound of anklets led them up to the mandir and disappeared. By that time, Swami, dressed in beautiful clothes, was waiting in the hall to welcome them. As soon as they saw Swami, they just dropped the washed wet clothes from their hands, rushed towards Him, hugged Him, praised Him and wept. Swami stood there, smiling. Before the boys arrived, Swami had, however, told that two great vedantins (highly knowledgeable souls) were coming that day and He was anxiously waiting for them. So the devotees knew that Swami was joking. The devotees stood there watching the boys weep. After sometime, Swami freed Himself from them and consoled them lovingly. He asked the devotees to get food and ate with them in the same plate. He then took them to His room, talked to them for a long time and sent them home the next day. In the evening of another day, bhajans had not yet started. A group of people, who had missed a bus, came to the mandir. A woman from that group came to my mother's room and asked for drinking water and enquired where she could have a wash. When she was told to go to the nearby canal, she requested my mother to show her the way. My mother accompanied her a short distance, showed the way and returned. By the time the lady returned, Swami was standing in the hall dressed in a parrot green coloured gown, which He had never worn before. He had combed His hair and was chewing betel leaves. And as soon as she saw Swami, she cried, “Oh, my dear king of yogis!” and fell unconscious in the courtyard. After sometime, she regained consciousness and said, “Where were You hiding all these days?” Saying so, she ran towards Swami to hold Him. Swami hid behind the curtain in the Bhajan Hall and held it tight. Since she could not move the curtain, she ran around searching everywhere else crying, “Krishna, Krishna” and fell down unconscious. Swami immediately came out running, asked for water and sprinkled it on her face and applied vibhuti. He asked the other ladies to fan her. He asked for akshata (yellow rice grains) and sprinkled it on her. Afterwards, whenever she was revived, she would run around searching for Swami and then fall down calling, “Krishna, Krishna”. The whole night she kept awake. She was meditating upon krishna. Nobody else had seen this even though all of them slept in the same hall. Later on, we came to know that she was worshipping Andal, for the past twelve years. She passed away peacefully as predicted by Swami. At dawn, Swami would get up, wash His face and drink the hot beverage offered by devotees, move around happily and talk sweetly to them. 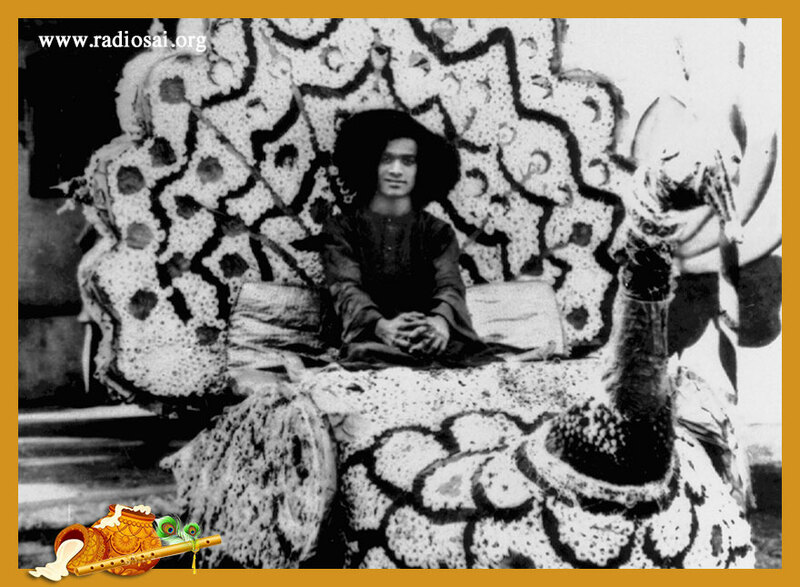 At 9 a.m. after Swami had showered, devotees would offer Him the breakfast they had prepared. Swami would taste a bit from each, joke and distribute the same to all as prasada. After breakfast anyone could perform padapuja (worshipping His feet) to Swami. There was an old cane chair in the mandir, which would be placed in the hall. Swami would sit on it. Requesting Swami to place His feet in a plate, we would wash them with scented water, wipe with a towel and apply arisina and kunkuma. We would then garland Swami and offer naivedya of which Swami would take a small quantity. After arati everyone would do padanamaskara. 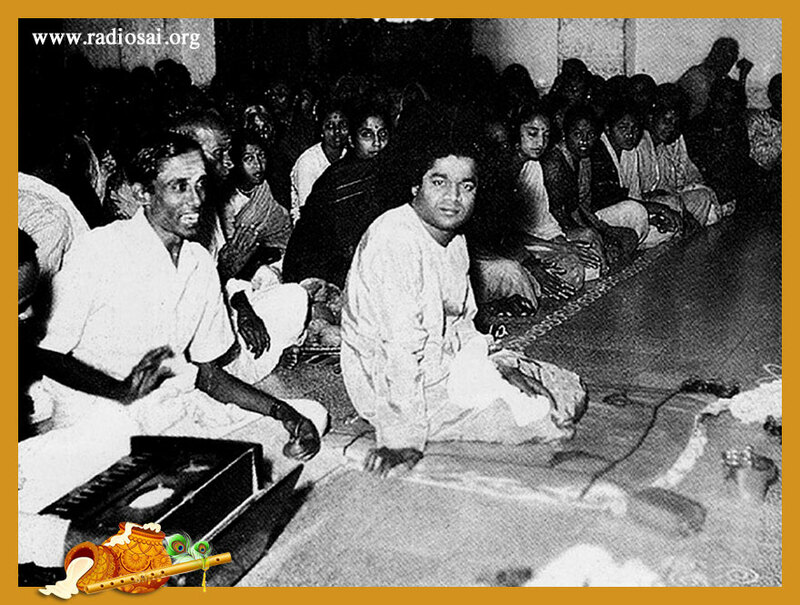 While doing padapuja, Swami would tell us to sing with devotion instead of doing the rituals mechanically. Bhajans would start around 11 a.m. There was no rigid time set for bhajans. It did not consist of namavali (only Gods names), as is presently sung. Most of the bhajans were generally lengthy songs. Any person could sing during bhajans. Swami would sit on the 'Om' slab and sing. 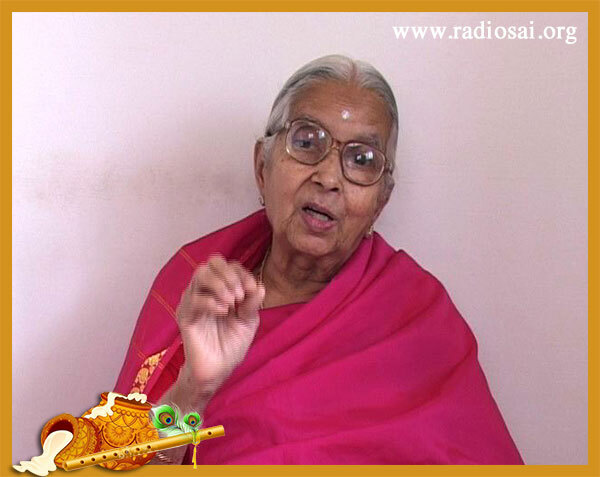 His sister Venkamma would also sing along with Him. The hall was small and the men and women sat on either side. 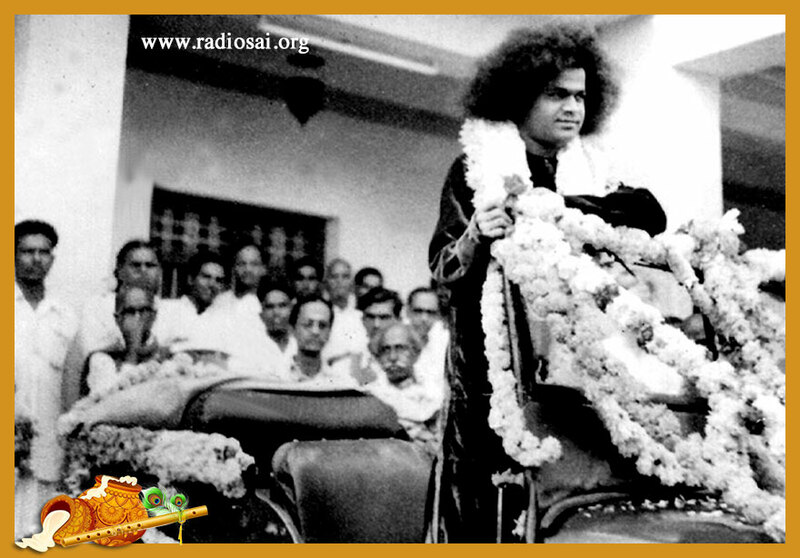 Some men sat behind Swami fanning Him, in spite of which Swami's dress would be wet with sweat due to excessive heat. Later, Swami would perform arati and distribute prasada to everyone. At 1 p.m. everyone would assemble for lunch. 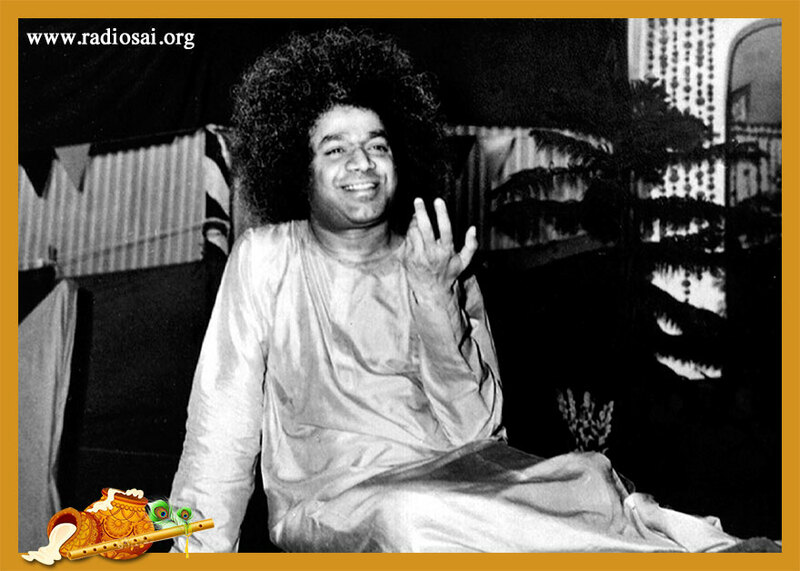 Swami would take a little bit of food from everybody, mix it, eat a little and distribute the rest as prasada as He would do at the breakfast. Later He would rest for a while. Even in those days, Swami never took sweets, ghee, milk or curds. When pressed by devotees for the reason, Swami replied that He had had enough of them in Krishnavatara. At 4 p.m. Swami would take all the devotees to the riverbed. Sitting on the expansive sands, He would sing and ask devotees also to sing. He would materialise idols, fruits, vibhuti, sweets, savouries, etc. from the sand and distribute them to everyone present there. He would also talk about spiritual matters and delight the devotees with joy and wonder. While returning to the mandir, Swami would walk in front and advise us to follow Him singing songs. There would be bhajans in the mandir for a while. Soon after arati, everyone would have dinner. In the night, Swami would walk around the mandir with a torch. Puttaparthi in those days abounded with snakes and scorpions; they lived with us! No one was however bitten by them, thanks to Swami's grace. Even dogs and cats would move inside the mandir freely. Swami had a thick notebook with Him in which all the songs were written. When we forgot the tune or lyrics of any song, we would ask Swami for the book. He used to give us the notebook, teach us the tune and tell us that we could copy the lyrics from the notebook and return it. Villagers in and around Puttaparthi would come in groups and request Swami to perform puja in the mandir and give prasada to them. Swami would gladly oblige. In the mornings and evenings, Swami would wait at the gates of the mandir for the arrival of bullock carts carrying devotees. On seeing the cart full of devotees, Swami would express happiness and enquire about their welfare, whether they had their lunch or tiffin, and would move with them happily. 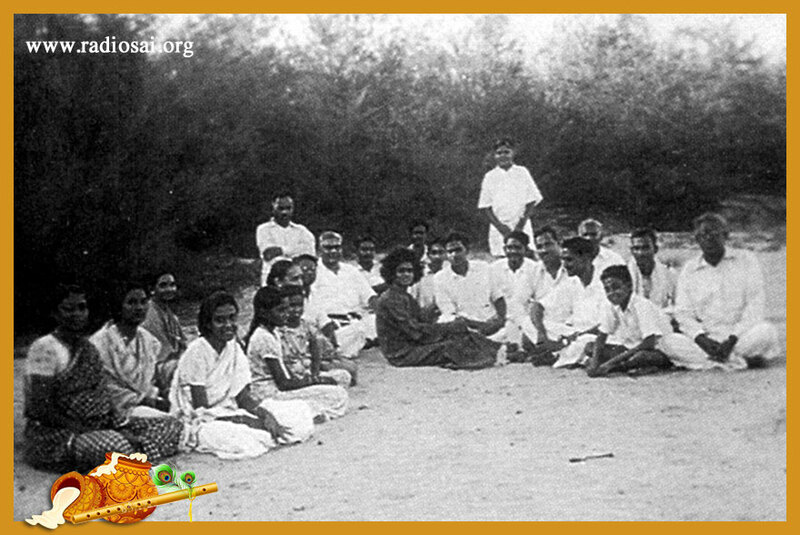 While waiting at the gates, Swami would pity the farmers labouring hard in the fields for hours in the hot sun. He would lament that farmers were not getting rewards commensurate with their hard work, and that somebody else enjoyed the fruits of their labour. Milk and curds were available only in the morning in Puttaparthi. They had to be stored for the evening. The large animal population of cats and dogs present in Puttaparthi made this an unenviable task. There was no safe place to keep the vessels containing milk and curds. We had to keep a constant vigil lest the animals tamper the vessels and gobble up the contents. Worse, they sometimes ran away with the vessels too. A distraught devotee once lamented on her plight before Swami and He admonished her saying, “I am not here to watch the cats and dogs. But I will definitely watch whose feelings you hurt!” The searing heat in Puttaparthi only added to our woes. Yet everybody wanted to be near Swami and when the time came to get back to their own homes and their own people, everyone became sad and tearful. Even today there are people who doubt Swami's manifestation of divinity and call it magic, trickery, etc. In the early days, it was but natural to expect that there would be more skeptics. Knowing their minds, Swami would ask them to take a handful of sand anywhere from the vast riverbed and wish whatever they wanted from the sand. And they got it too! Unmindful of both the praise and censure, Swami would perform one miracle after another for the devotees. At that time, only He knew the real purpose of performing the miracles – some watched them idly, others with awe and wonder, and a few with joy. With what perseverance and patience, Swami opened the eyes of the devotees, step by step, into the real intent and purpose of these miracles! But even in those early days, we somehow felt that our real joy was only in seeing Swami and being with Him, not in asking and getting anything from Him.